The right mix of manoeuvrability, auto-stability & performance for established pilots. Our new pure intermediate powerglider incorporates some of the performance technology from the world famous Action and Action GT to the proven safety and stability features of the Revolution. The result is an incredible Fusion of technology, experience, and shear design from Mike Campbell-Jones and his team! Pilots moving up the skill range from the Revo 2 will instantly feel at home with the Fusion, other pilots who already have a considerable experience in paramotoring will be delighted with the Fusion’s dynamic handling, and direct response to pilot inputs. Coupled with Mike Campbell-Jones’s next generation "Reflex" profile which is easy and comfortable to adjust, allowing you to go further and faster with the added benefit of real pitch positive ‘True Reflex Technology’! 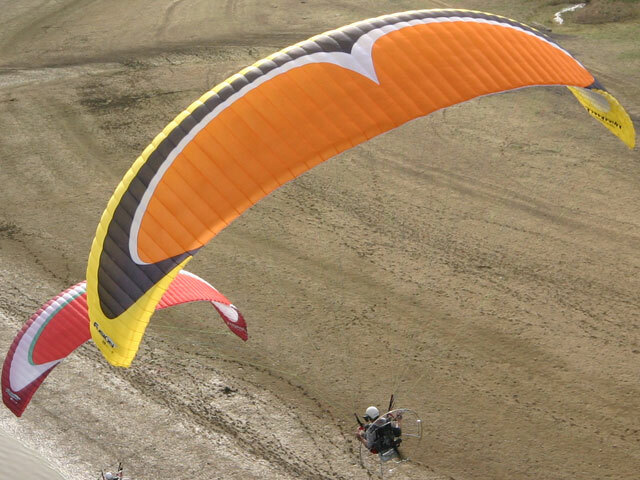 When you first take to the air you will immediately notice the improved sink rate and glide ratio on slow trimmer position (similar to that of a modern paraglider). As for the Fusions handling... in the hands of an estabilished pilot, it really is a joy to fly! With an out- standing roll rate for carving tight turns, giving you precise control over wing and motor. In the neutral or fully reflexed trim setting the Fusion takes on the legendary stability and speed, coupled with our new wingtip steering controls turning it into the perfect cross country machine. The new composite leading edge (CLE) and latest MCJ reflex profile, make launching almost too easy! Our specifically designed leading edge composite has the unique property of being ridged in one direction only and flexible in others. It gives the Fusion a very clean leading edge, so improves performance, strength and launching whilst reducing the overall weight. CLE leading edge is just as strong if not more robust then standard leading edges! Note - Performance figures may vary depending on pilot/motor weight and drag. Click the button below to add the Paramania Fusion Paraglider to your wish list.